(CNN) -- The World Bank cut China's economic growth forecast in 2009 to 6.5 percent Wednesday, down a full percentage point from November's projection. Workers assemble toys on a production line at a factory in Shantou, in China's Guangdong province. Despite the downgrade, "China is a relative bright spot in an otherwise gloomy global economy," said the World Bank's David Dollar. Last week, Chinese Premier Wen Jiabao reiterated projections that the nation's economy will grow by 8 percent in 2009, despite doubts expressed by domestic and international economic analysts. Some have forecast growth as low as 5 percent. "I will admit it will be a difficult job [to reach 8 percent]. This being said, I also believe with considerable efforts it's possible for us to obtain this goal," Wen said at a news conference following the annual session of the country's rubber-stamp legislature. China has seen a sharp decline in demand for its exports since November as other major economies have struggled. In February, Chinese exports plunged 25.7 percent compared with the previous year's, Beijing reported last week. Even with the slowdown, China's economy -- the third largest in the world -- has gone from white-hot to merely robust. 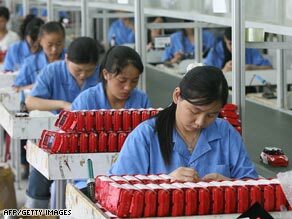 In 2007, China's gross domestic product grew at 13 percent. The two largest economies -- the United States and Japan -- are in recession. "So a lot of things will go down in 2009 globally," Dollar said. "But we see China's contribution as being very positive in keeping many markets from going down as far as they would otherwise." The World Bank expects China's economy to outgrow most others in 2009. In November, China announced plans to inject $586 billion (4 trillion yuan) into its economy to offset declines in industrial and export growth. That economic stimulus plan included the loosening of credit restrictions, tax cuts and massive infrastructure spending.